Spring is in the air, and now is the ideal time to plan a special springtime getaway. If the Sunshine State has caught your attention for upcoming travel plans, look no further than Orlando, which offers a wealth of fun events and activities, plus all that Florida sunshine. 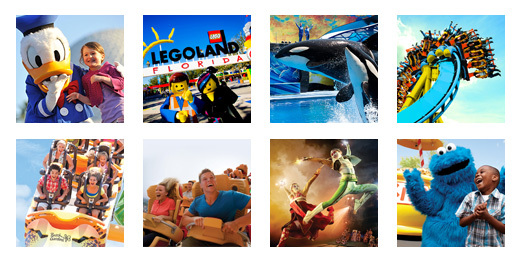 TicketsatWork.com has rounded up five superb vacation ideas to enjoy with family and friends in Orlando this spring. Plus, you’ll save big with our great deals. Every night from now through April 7, you can experience the sounds and sizzle of a New Orleans celebration at Florida’s biggest party – Universal’s Mardi Gras. Experience an authentic New Orleans celebration filled with dazzling entertainment at Universal Studios Florida™. Enjoy parades each night with outrageous street performers, colorful costumes and beads flying through the air. You can also chow down on Cajun cuisine. Plus, on select nights you can catch some of the biggest names in music. It’s a wild springtime party with over-the-top parades, authentic food from the French Quarter and electrifying live concerts. Don’t miss our exclusive ticket savings for Universal Orlando at TicketsatWork.com. Special ticket offer: Get 5 Days for the price of 3! Visit 3 Parks for less than $54 per day! Fun is blooming at the 25th annual Epcot Flower & Garden Festival at Walt Disney World Resort through May 28. This year’s festival, which takes place during Epcot’s 35th anniversary, showcases brilliant blossoms and flavor-rich cuisine from 15 Outdoor Kitchens, as well as Disney topiary stars, interactive play gardens and live chart-topping musical acts during the Garden Rocks Concert Series. TicketsatWork.com has a variety of ticket specials for Walt Disney World, so you can celebrate springtime at Epcot. New and creative dishes at 15 Outdoor Kitchens encircling the World Showcase Promenade. Sip and savor your way around Epcot, enjoying chef-inspired noshes and refreshing libations. A bonanza of Disney character topiaries, including classic-character favorites Mickey Mouse, Donald Duck and many others. Returning this year, Belle will be featured in France along with Beast, Snow White in Germany with the Seven Dwarfs and Anna and Elsa in Norway. A brand-new Future World interactive play garden and a revved-up Road to Florida 500 garden featuring new games and play challenges. The new interactive area in Future World features a play maze, a sensory garden, an activity zone and a covered seating area. A new Epcot front-entrance topiary garden sets the milestone anniversary scene with a kaleidoscope of blooming flowers, where topiary icons Mickey Mouse, Minnie Mouse and Goofy greet festival guests. Buy any 4 Day Park Hopper® or Park Hopper® Plus Ticket, and Get the 5th Day FREE! Sip and sample your way around the world of international street food and craft beers, and enjoy live performances at the Seven Seas Festival at SeaWorld Orlando (through April 15). Dance to lively tunes from top country, rock and Latin stars every Saturday and Sunday. This year, discover 12 International Markets throughout the park, which include All-American, Asian, Brazilian, Caribbean, Florida, German, Gulf Coast, Mediterranean, Mexican, North Atlantic, Pacific Coast and Polynesian. Save 30% on a SeaWorld Orlando Single Day Ticket and enjoy the park + the can’t-miss Seven Seas Food Festival. Grab the flip flops and swim shorts because the sun is shining and Orlando features numerous water parks to enjoy during your springtime vacation. Aquatica, SeaWorld’s Waterpark: From high-speed water slides and exhilarating wave pools to tranquil beaches and remarkable animal habitats, this water park delivers! Save over 25% on Single Day Admission. Disney’s Typhoon Lagoon Water Park: This 56-acre water park features thrilling waterslides, raft rides, a children’s play area and a giant wave pool at Walt Disney World Resort. Soak up a storm of fun under the Florida sun – plunge down rushing rapids, sunbathe on a sandy beach, glide down a lazy river and enjoy the thrills and spills of the whitewater journey called Miss Adventure Falls. Save on tickets! Disney’s Blizzard Beach Water Park: Discover frosty fun for the whole family. Zip down the slushy slopes of Mount Gushmore on one of the world’s tallest and fastest waterslides. Float down the tranquil river and sunbathe on the white-sand beach. Enjoy the snow and ski theme while dipping into 80 degree water Save on tickets! Florida Resident – Universal Orlando Resort: For Florida residents, get 4 days with Park to Park for the price of 2 for Universal Studios®, Universal’s Islands of Adventure® and Universal’s Volcano Bay® Water Theme Park. At Volcano Bay, thrills and relaxation flow in perfect harmony. Here, the TapuTapu™ wearable lets you hold your place in the ride lines and reveals wondrous surprises with just a wave of your wrist. It’s a tropical paradise just steps away from everything Universal Orlando Resort™ has to offer. CoCo Key Water Park: This family-friendly resort offers a tremendous value and makes children happy! CoCo Key Water Park is located on International Drive, combining the relaxation of the tropics with the excitement of an adventure-filled outdoor water park. Save 40%! If you’re ready for a break from the theme parks and water sides, Orlando features a variety of entertaining shows. Blue Man Group: A remarkable blend of creativity and fun, a Blue Man Group performance is one of those “gotta see it to believe it” events. If you’re looking for an entertaining night out in Orlando, the Blue Man Group show is a joyful exploration of art, technology and music. Select Seats from $43! Limited Time Only! Sleuth’s Mystery Dinner: A comedy mystery show where you become the detective and solve the crime! Watch out – you might be chosen for a cameo role in the longest running mystery dinner show in Orlando. Save over 35% on tickets! Medieval Times Orlando: Don’t miss the exciting Medieval Times, a family dinner theater featuring staged medieval-style games, sword-fighting and jousting. Save over 40% on tickets. The Outta Control Dinner Show: Enjoy non-stop laughter and food – this show is seriously entertaining and funny. It’s magic with a twist! The dinner includes unlimited hand-tossed cheese and pepperoni pizza, salad, dessert, soda, beer and wine. Save over 20% on tickets! Spring has sprung – check out TicketsatWork for awesome seasonal savings.